Learn the clever Twosey-Foursey method and make this striking quilt the easy way. 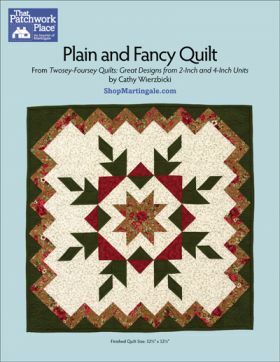 Simply start with 2½" x 4½ " fabric strips and make triangles using "flippy" corners, which means you don't actually handle a triangle shape. Cathy Wierzbicki keeps it fun! Finished quilt: 32½" x 32½"
Cathy Wierzbicki is an experienced quiltmaker and all-around crafty person. She lives in the Pacific Northwest with her husband, Tom, but she never turns down an opportunity to be in the Midwest, where you can often find her enjoying time with her two children and three grandchildren. 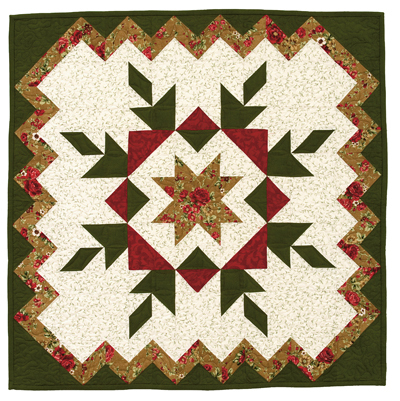 She looks forward to more opportunities to travel and share her love of quilting with quilters wherever they gather. 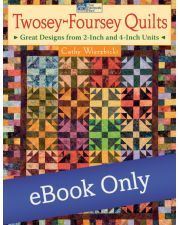 Cathy has written several quilting books and is the owner of Time to Quilt, a pattern-design company.